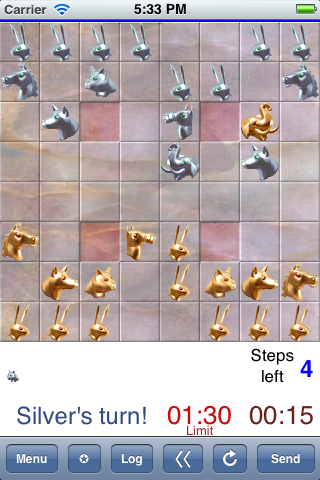 The game view shows the board and the game pieces that are moved around by dragging with touch. Below the board area you can see the removed game pieces and the steps left in the current move. If the moves are time limited the limit value is shown along with a timer telling how much time has passed already. The toolbar at the bottom of the screen has buttons for accessing the Menu, checking the move log and taking back or replaying the moves. Each move is completed by a press on the Send button which switches the turn to the opponent. A slot of the move log can be opened below the board. Selecting a row in the log allows you to jump to a certain point in the game and replay the moves one by one. The full version of the application gives also a possibility to initiate a new game from any selected point in a game. This way it is possible to for example practise different kind of plays from the same starting situation or maybe you want to create a challenging setup and try to survive it by trying different strategies or changing sides in the middle of a game. of the game view. In iPad the moves are listed beside the board when not in full screen mode. rules are simple to understand and after watching this short introduction you'll be ready to play. For more info about the game you can always visit the Arimaa home page at www.arimaa.com. The latest version of the application has dedicated views designed for the game to be played on iPad. In full screen mode you can maximize the size of the board for easy playing. The mostly needed controls are available by the side of the board but for accessing the menu you need to exit the full screen mode first. The free version of the application does not include this iPad support. In the settings view you select the mode for the game. If you select the Watch mode the bot will be switching turns and basically playing against itself. In Play mode you can choose to play against the bot and select your side as Gold or Silver. If you select to play with a friend the bot is disabled and the game is played as a two player game. The contents of the settings menu changes with your selections hiding the options that are not valid in the selected mode. A timer can be set for playing timed games. If you have enabled the timer and you spend up all the move time without pressing the send key the game will end and you have lost. The autosend switch is there to save you from losing accidentally. When autosend is enabled and your time runs out the game automatically sends your unfinished move as is and switches turns. Even in this case you must have done at least one step of the move for the autosend to have something to send. The settings offers also a switch for turning off the game sounds. The game pieces are normally moved by dragging them by touch on the screen but this can also be disabled. In this case you move the pieces by first tapping a piece to select it and then tapping again on the square where you want to move the piece. There are couple of options for rotating the view between moves. Rotating the board between turns makes sense in two player game so that both players can hold the device in the upright position and keep the playing direction from bottom to top. In Friend mode if you set the friend to sit across the whole screen gets rotated between turns. This way you can keep an iPad on the table between players and the game will always rotate to face the player whose turn it is. The auto pause feature pauses the game after each turn and hides the latest move as well as the board. This way the time between turns can be long but yet the player in turn will not be able to plan the next move while the game is paused. Once the Continue button on screen is pressed the board is revealed and the timer starts counting again. The menu button on the game page opens an access page to other features in the application. You can for example access your saved games and continue unfinished games. You can also check the scores that the game is collecting of the games that you play against the bot at different levels. If you have a need to export the move list of a certain game you can do it be emailing the list. The latest application version also has a sharing possibility where you can post an Arimaa link to either Facebook or Twitter. You are also encouraged to use the Share link to post a review to AppStore. In case you face some issues or have comments about the game that you want to pass to the application developer there is a 'Write to support' button for that purpose.